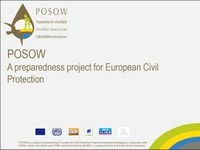 General presentations of the POSOW I and POSOW II have been produced for introducing and promoting the projects. Feel free to use and disseminate them! Besides English, the presentations are available in Arabic (AR), Croatian (CR), French (FR), Greek (GR), Italian (IT), Slovenian (SL) Spanish (SP) and Turkish (TU).